Puri is one of the Chaar Dhaams of Lord Vishnu. The four ancient tirthasthanas with Badrinath, Dwarka and Rameswaram that have been on the pilgrim’s trail for centuries. Puri is also among the four locations where the Hindu saint and scholar Adi Shankaracharya established his monasteries or mathas in the 8th century. Puri has been a religious centre and pilgrimage since the first millennium and has attracted thousands to its legendary rath yatra, the most famous chariot festival in India. 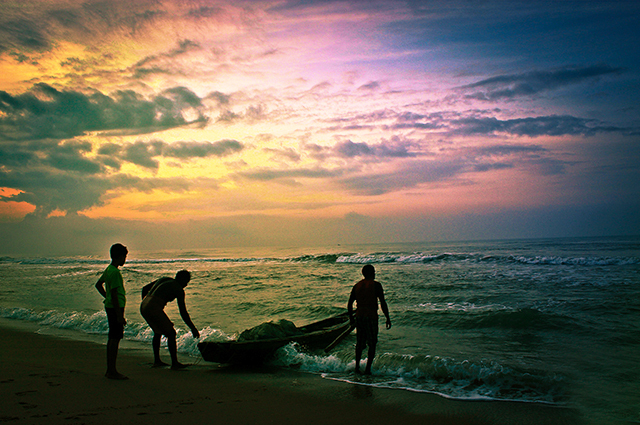 Standing on the Coromandel Coast of India’s eastern seashore Puri is the premier pilgrimage of an ancient land. It is set in a tropical landscape of turbulent seas and endless stretches of golden sands, fishing boats bobbing on the waves, palm trees and paddy fields. Once this was the ancient kingdom of Kalinga and it is also called Nilachal and Utkal. 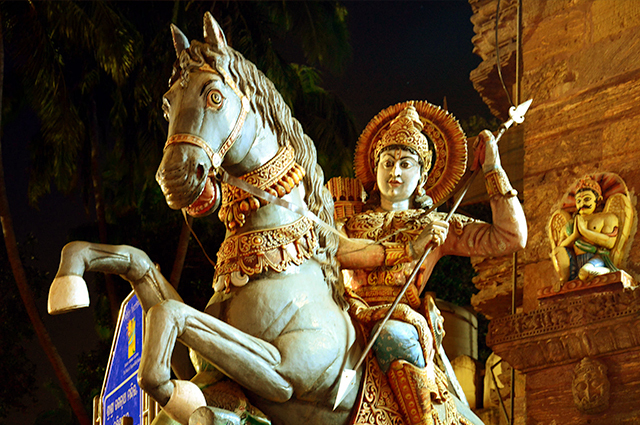 As the chosen home of Lord Vishnu on earth it is called Martya Vaikunth and also Shri Purushottam Dhaam. Puri has been a sacred space to not just Hindus but also Buddhists and Jains. Today through daily rituals, music, dance and a vibrant chariot festival Puri calls pilgrim to a joyous worship of Lord Jagannath. At the heart of Puri is its greatest shrine – the Jagannath Temple. The temple is dedicated to Lord Krishna, the eighth avatar of Lord Vishnu. In this huge temple Krishna is worshipped as Lord Jagannath, the Supreme Lord of the Universe. He is the god who rules over the three worlds of swarga, marta and pataal – heaven, earth and the netherworld. What makes this shrine unique are the three icons of Lord Jagannath and his sister Subhadra and brother Balabhadra that welcome pilgrims to the sanctum. The three primitively carved wooden images with large circular eyes and wide smiling mouths are very different from the usual depiction of Hindu deities. Over the centuries Puri has attracted the saints and scholars of many religions. It was a famous port of the kingdom of Kalinga and it was once the Buddhist pilgrimage of Dantapuri where a stupa once stood. Later the Hindu scholar Adi Shankaracharya established the Goverdhan Matha here. The Vaishnava Bhakti saint Chaitanya Mahaprabhu lived and gained nirvana here. The teacher and Vishnu devotee Ramanujacharya worshipped at the temple. The deity has inspired many poets. Jayadeva sang the praises of Lord Krishna in his book Gita Govind and his songs are sung at the temple every day. Guru Nanak, the founder of Sikhism visited Puri and composed one of his most lyrical hymns while sitting before the Jagannath Temple. 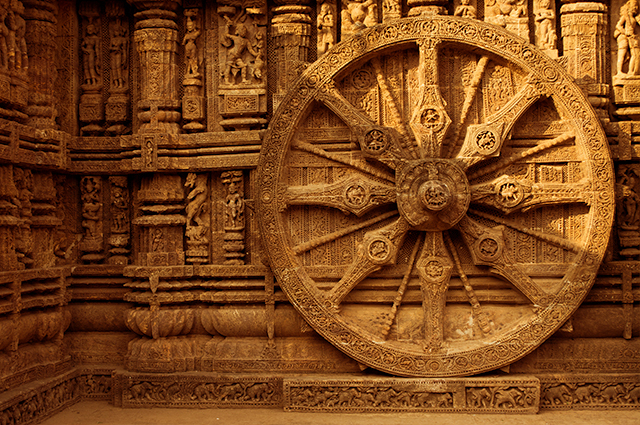 The word ‘Puri’ in Sanskrit simply means a place of human habitation, a town or city. It has many other names, it is Shri Kshetra, the land of Krishna; Shankha Kshetra, as it is said to be shaped like a conch shell; Nilachal and Niladri after the hill on which the temple stands and Purushottam Dhaam, the dhaam of Vishnu, the celestial being. Puri is a sea tirtha on the Bay of Bengal in the eastern state of Odisha (earlier Orissa). It is 56 km from the Odisha capital of Bhubaneswar; 81 km from Cuttack and 478 km from Kolkata. The famous Sun Temple at Konarak and the Chillika Lake are also within driving distance from Puri. Since ancient times this area was part of the kingdom of Kalinga that was a maritime power and traded with far eastern countries like Burma and Indonesia. Kalinga is part of ancient Indian history because the Mauryan king Ashoka invaded the kingdom in the 2nd century BCE and after winning the battle he was overwhelmed by remorse and renounced war forever. 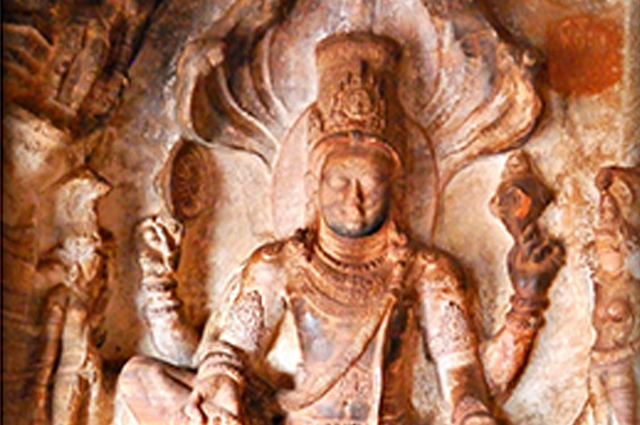 The rise of Buddhism in the country and its spread to China and the Far East begins at Kalinga. Puri was one of the biggest ports of the kingdom. Two great temples were built on the Coromandel Coast – the Jagannath Temple at Puri and the Sun Temple at Konarak and they have been mentioned in many ancient texts. Sailors voyaging along this coast used them as landmarks, calling the Puri temple the ‘white pagoda’ and the Konarak temple the ‘black pagoda’. This tropical region is the home of many tribal communities and among them are the Sabars who are intimately connected to the rites and rituals of the Jagannath Temple. These communities live in forests of sal, teak and sandalwood trees. Moving inland from Puri one goes through a picturesque landscape of villages surrounded by emerald paddy fields, mango groves, palm and casuarina trees. Once the kings of Puri ruled their land as the earthly representatives of Lord Jagannath and even today this is Jagannath’s kingdom, as he is the beloved lord of his people. The dhaams are a part of our epic traditions and are mentioned in the puranas. In the Ramayana Lord Ram, the seventh avatar of Vishnu worshipped Shiva at Rameswaram after he had rescued Sita by winning the battle at Lanka. The Mahabharata says that after the great battle at Kurukshetra the five Pandava brothers went on a pilgrimage to atone for the killing of their family and worshipped Vishnu at the four dhaams. So Puri is the eastern or Purba Dhaam of Lord Vishnu. Here he is worshipped as Lord Jagannath, a form of Lord Krishna and in the company of his sister Subhadra and elder brother Balabhadra. This makes it rather an unusual trinity of deities as usually a god is worshipped with his consort. For example Krishna is worshipped with his queens Rukmini and Satyabhama in Dwarka but not at Puri. There is an amusing myth of how Lord Vishnu spends his day and it has a close connection to one of Puri’s most famous institution – the temple kitchen that produces the sacred offerings. This multi-course meal is called mahaprasad and it is first offered to the three deities and then given to their devotees. In the myth it is said that Lord Vishnu as the preserver of all creation visits all the four dhaams every day. He starts his day in Badrinath where he bathes in the Alakananda River that flows beside the main temple. Then he lands by the sea in Dwarka and adorns himself in his golden garments and jewellery. At Puri he is offered a magnificent meal of fifty six dishes called ‘chhappan bhog’. At all the temples the kind and generous deity is busy listening to the prayers of his devotees, so by the time he arrives at Rameswaram he is tired and takes a well-earned rest. Lord Jagannath is offered the mahaprasad, a total of fifty six dishes, five times every day. So the kitchen that prepares this giant meal is said to be one of the largest temple kitchens in the world. After the Mahaprasad has been consecrated by being offered to Lord Jagannath and his siblings it is sold to pilgrims in a market called Ananda Bazaar that stands outside the temple. The temples built by the kings of Kalinga are among the finest in the country. The architecture follows the Nagara style that was popular in North India but with some variations in design. The temple tower or shikhara has a unique curving shape and is topped by a fluted disk called amalaka and a pot shaped finial called kalasha. These spires are among the tallest in Indian temples and the main shrine or garbha griha that stands below the spire is called the deul. The temple is like a world in itself within a walled enclosure with many gateways, smaller shrines, assembly halls, offices, kitchens, stores and courtyards. The temple precinct is surrounded by a high wall and pilgrims walk through the gateways to enter a row of halls or mandapas that lead to the main sanctum. These mandapas are open pillared halls with many tiered pyramidal roofs. The main assembly hall is called the jagamohan and it is attached to the sanctum. This is where the devotees gather to watch the religious rituals and the daily pujas. Then there is the bhoga mandapa, the hall of offerings and the natya mandapa that is the hall of dance. The pillars and exteriors of the shrine and the mandapas are all covered in exquisite carvings that are worth studying because they are like a living portrait of our land. Here you can see a profusion of gods and goddesses, dancers, saints and demons all carved with amazing artistry. Puri is connected to many other faiths. During the early centuries of the first millennium, when Buddhism was a popular faith in India, Puri was a Buddhist pilgrimage called Dantapuri and a stupa was built over the relics of the Buddha. Some Oriya kings were Jains. Then Hinduism became popular with the presence of the Shankaracharya math. Puri’s connection to Sikhism led to the founding of the Bauli Math Gurudwara with a Granth Sahib that commemorates the visit of Guru Nanak to Puri. 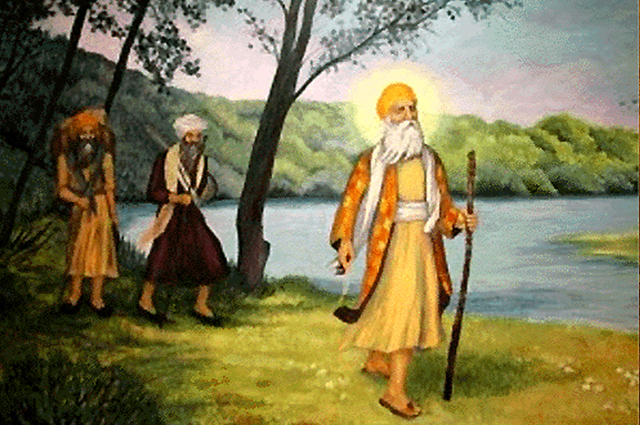 The poet-saint Nanak and his companion, the rabab player Mardana came to Puri in the 16th century. They were not allowed to enter the Jagannath Temple as Mardana was a Muslim and so Nanak decided to sit outside the temple where he composed his own offering to the deity. In a temple the priests perform the ritual of aarti with lighted lamps, flowers and incense on a copper plate. Nanak sang his own aarti with the elements of nature itself, the sky, the sun and the stars and set it to Raag Dhanashri.